I had to satisfy my curiosity and see how a second day at FloydFest would seem. I was game to go there and was prepared to enjoy myself, but I wondered if it would be like going back to a circus for a second visit. It was still an enjoyable experience because FloydFest is not a circus. For the most part, it is real people and real entertainment by performers who are willing to take time to talk with you when they are not on stage. On this second day I saw many things I had missed the first day and it was every bit as enjoyable. One of the things I noticed on the first day was the Camp Store and I thought it was a fantastic idea! Today, I stopped in and chatted with John Crawford who came up with the idea of a store last year while camping at FloydFest 2006. 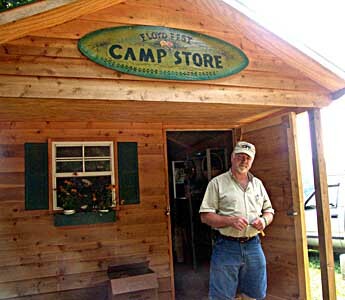 He and his wife Jolee created the store to provide campers with the necessities of life like boots, tents, water, camping chairs, etc. It was a successful operation from the very first day. John, Jolee and son Tucker have been working from 8am to midnight all through FloydFest to keep up with demand and they ran repeated trips into town for more supplies. I have posted most of today’s pictures on Flickr and they are in the beginning of the slide show. The fact that most of the staff, volunteers and vendors are from the local area gave the entire festival a feeling of small-town hospitality. I found myself spending more time chatting with staff and vendors than watching performances. As a matter of fact, most of the videos I shot of people dancing to the music showed vendors dancing in front of their booths when they weren’t waiting on customers. This festival is more of a party and is more light-hearted than any other festival I have seen. 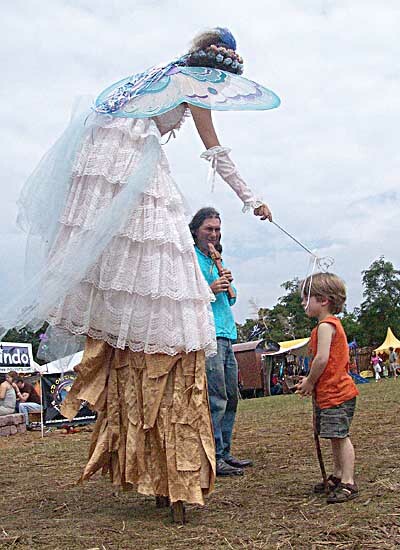 My artist friend Alina Ever plays the 9 ft tall Blue Fairy granting wishes to all and sundry, while husband Chris Deerheart accompanies her playing a native American flute. She granted me a wish and it came true. Even though it was the end of the fourth day, everyone seemed still seemed to be enjoying themselves although many of the vendors I talked to admitted that they were bone-weary after days of non-stop effort and late night celebration with old friends. Dancer Vivian of Spiral Hoop Dance was still able to perform so I could video her, but even she said she was beginning to run down. Her hoops are for dancing and are larger and heavier than the hula hoops that were childrens toys. 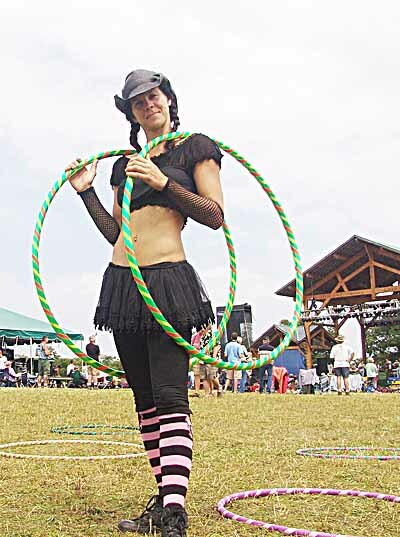 I saw people dancing with her hoops all over the festival grounds so she must have been spreading the word about the spiritual side of hooping. Natasha the Caterer had the Sushi booth and she sold out several days in a row and had to close the booth for lack of food to sell. That was a surprise for everyone including Natasha! After all this is the Blue Ridge Mountains, not California. When I arrived at the FloydFest grounds, a cloud had enveloped the festival and the air was damp and cold. By Sunday afternoon the sky was clear and the sun was hot. The booth that sold Apple Crisp with ice cream had long lines of customers standing patiently for their turn. Potter Tom Phelps had a huge new tent to ward off inclement weather and was doing a land office business. Eli Shwartz-Gralla of Inner World Glass had exquisite individually designed pendants and earrings that had to be seen to be believed. They are masterpieces of the glass workers art. I saw one I wanted to bring home as a present for Gretchen. The pendant had 24 karet gold smoke captured in the twists and swirls of molten glass and I couldn’t take my eyes off of it. However, I need to generate more disposable income before I can afford that $250 bauble. Post-corporate life does have its limitations and limited disposable income is one of them. The freedom we enjoy more than makes up for that inconvenience. One last image captures the natural joy and artistic freedom experienced by even young attendees. These children found a small puddle left by a rainstorm and were using the mud to draw pictures on pieces of wood. They went about it very deliberately. 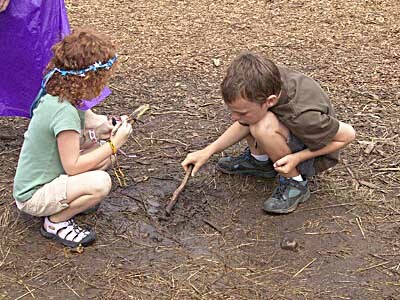 The boy stirred the mud to a liquid consistency and then both used the liquid as colorant to draw on pieces of wood. These future artists embody the creative energy that infuses all of Floyd County and the area around it. All in all, it was a fine end to the weekend. I can’t wait to get to the Cafe del Sol for a recap and find out what I missed. This entry was posted in Seen around Floyd and tagged Alina Ever, Blue Fairy, Chris Deerheart, Eli Schwartz-Gralla, Floydfest 2007, John Crawford, Natasha the Caterer, spiral hoop dance, Tom Phelps. Bookmark the permalink. You got some great shots, David. I love reliving the scene through everyone’s photos.